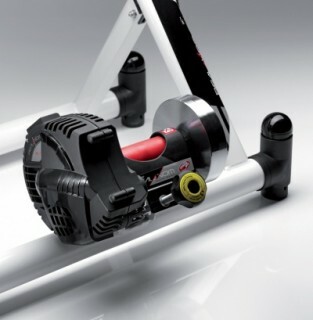 The Elite RealAxiom of part of Elite’s impressive Real range of turbo trainers. This means as standard it comes with the Real software, ‘dancing’ support feet, and solid frames and a high performance wireless electro-magnetic resistance brake. The resistance of the turbo trainer is automatically controlled by software, with speeds and incline synced in real time to your trainer as you workout. 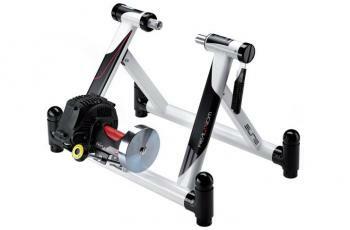 The RealAxiom is placed in the middle of two other cycle trainers in the Real range. The main difference between the trainers is the maximum simulated slope and power outputs. The Elite RealAxiom turbo trainer can simulate slopes of 10%, and its power output at a speed of 40km/h is a high 1200 Watts. 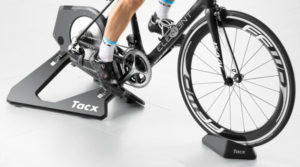 The lower priced RealTour trainer in the Real range has a maximum incline of 6% and a power output of 500 Watts at 30km/h, while the top-end most expensive Elite Real turbo trainer is the RealPower with a very high 20% maximum incline and an impressive 500 Watts of power at low speeds of 15km/h. The resistance unit uses a large Elastogel roller than reduces noise levels by 50% and rear tyre wear by 20% compared to conventional resistance rollers. A large flywheel is also incorporated in the resistance unit, which delivers high moments of inertia that translates to smooth pedalling at even the highest inclines and power levels. The frame itself is made from reinforced 50mm diameter tubing and comes with special spring-mounted feet that allow the trainer to tilt and roll as you ride. This provides a very realistic action and adds to the realism and overall experience while competing on one of the special RealVideo courses. You also get a handlebar mounted computer control console with the Elite RealAxiom turbo trainer. 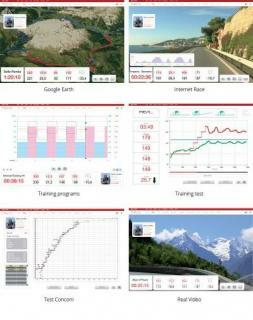 This allows you to control the software on your laptop or PC so that you can analyse your performance or alter your workout without leaving your bike. In addition to this you get sensorless cadence technology and a front wheel riser block as standard. Learn more about the Elite Real Axiom turbo trainer and the Real software on Elite’s official website here.